When compared to nearby Gulf Coast states like Florida, Texas, and Louisiana, Mississippi has a relatively small stretch of coastline, but that's still more than enough to give the Magnolia State some of the best beaches in the area. When the sun starts to shine and the air gets warmer, there's no better way to have some fun in Mississippi than by heading down to one of the state's Gulf Coast beaches. Whether you're looking to swim, sunbathe, surf, fish, or do some wildlife watching, you'll find a lot of options all around Mississippi. Funnily enough, the term ‘Ship Island’ actually refers to two separate islands, known individually as East Ship Island and West Ship Island. These are a couple of the barrier islands not far from Gulfport Beach. There are plenty of things to do around the Mississippi barrier islands, with Ship Island being one of the best areas to visit. You can only get here by boat, but it’s worth the trip, with the beaches on West Ship Island being especially beautiful. There’s also a huge old fort situated on the island that can be fully explored, with guided tours running here each day. 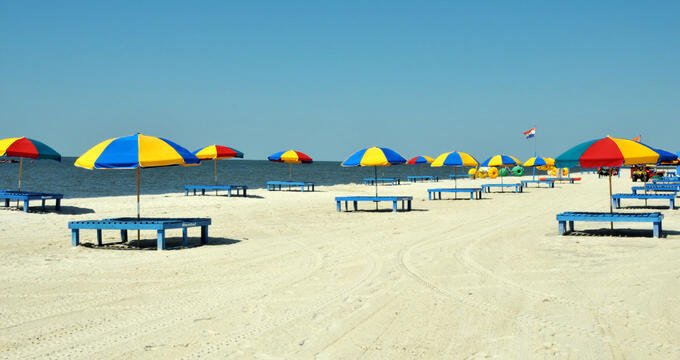 Situated in Ocean Springs, East Beach is a far cry from the flashy casinos and playgrounds of places like Biloxi Beach. You won't find too many tourists here at all, actually. Only the Mississippi locals tend to visit East Beach, meaning you can almost have the place to yourself if you come in the middle of the week. The beach runs for a long distance, with several fishing piers and simple amenities dotted out along the way. You can also find some nice guesthouses and cafes along this beach, so it's a nice spot to spend a relaxing day. Not far from Biloxi Beach is Bay St. Louis Beach, and this is a good Mississippi coastal location for people who want to enjoy the same aesthetic beauty of Biloxi without all the crowds and attractions. It’s a quieter, simpler beach, with the local town offering a calm, relaxing atmosphere and a lot of pretty old store-lined streets to check out. The beach itself provides great views and good conditions for lots of different activities, and it’s one of the best Mississippi beaches for fishing and watching the sunset. 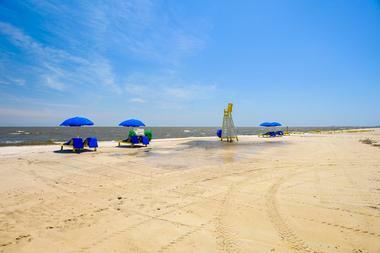 Another of the barrier islands, Horn Island is found not too far from major coastal cities like Biloxi and Gulfport. You can hitch a ride on a private charter or tour boat to get over there, with some brave adventurers even choosing to make the journey by kayak. Either way, when you get to Horn Island, you'll be greeted to some of the softest, whitest sands on the entire Gulf Coast. This is a great spot for couples to visit for a romantic getaway, while also being equally well-suited for families or groups of friends planning a camping trip. Thirty of the United States have some kind of coastline, be it on ocean coast, a gulf coast, or a coast along one of the five Great Lakes. Twenty three of them have states on the Pacific Ocean, Atlantic Ocean, or Gulf of Mexico, ensuring that many Americans are never too far away from the beach. So, whenever you need to just get away from it all, embrace nature, and spend some time far from the noise, lights, and pollution of the big cities, the beach is always one of your best options, especially if you happen to be living or traveling in one of the coastal states. Despite having a relatively small stretch of coastline, Mississippi is still home to some of the finest beaches in the Gulf Coast area, with the likes of Biloxi and Gulfport being known all around the nation. So the next time you're in Mississippi on a sunny day and want to spend some time swimming, surfing, sunbathing, or just enjoying the sand and sea with your friends and loved ones, be sure to visit one of the locations listed below. The information supplied in our Mississippi beach guide will help you learn all you need to know about the state’s best beaches.